Contrary to popular belief, the Windy City is not the windiest city in the US. That distinction belongs Brockton, Massachusetts. That’s not to say Chicagoans don’t get their share of wind whipping off Lake Michigan, though. Chicago is a windy, cold place, plain and simple, but it’s also a huge city with unique character and attractions. Chicago has all the perks of a major metropolitan area—diversity, density, arts, and opportunity. It’s one of the most iconic cities in the world, too. Famous skyscrapers spear its skyline, and there’s plenty of world-renowned shopping, dining, and entertainment at their feet. Chicago is located on the southwestern tip of Lake Michigan. It is in Illinois; however, it has close ties to communities in northwestern Indiana and southeastern Wisconsin as well. Chicago is built on flat land, which is naturally covered in forest and prairies. Chicago is the epicenter of the Chicagoland area, which includes the suburbs and cities of Naperville, Elgin, Joliet and Aurora, all which have populations over 100,000. The entire area is home to nearly 10 million people. Chicago proper is located in Cook County. The Magnificent Mile – Chicago is known for a stretch of its downtown area lovingly dubbed the Magnificent Mile. It’s a popular tourist attraction as well as a staple for Chicago city dwellers. There are tons of high-end shops, restaurants, and parks to experience. People flock to the Magnificent Mile to partake in its bustling nightlife scene, as well as to peer up at its regal skyscrapers, some of the tallest in the world. Iconic destinations – Chicago has many iconic destinations, including the Sears Tower, Wrigley Field, Navy Pier, and the Chicago-fire-surviving Water Tower. They’ve achieved a unique status as both economically and historically important. Food – Chicago has arguably one of the best food scenes in the U.S. Sure, it has many high-end restaurants and steakhouses, but it’s famous for greasy, belly-warming foods. Think deep-dish pizza, plump hot dogs, and au-jus-dripping Italian beefs. They all originated in Chicago! Public transit – Chicago is one of the best cities in the US for public transit. Downtown, it has the L-Train, which is like an above-ground subway. It also has an extensive train system that services the outer suburbs and that culminates at Union Station downtown. Fall – Chicago’s weather is mostly terrible, but fall in Chicago can be gorgeous. Crisp, colorful days fill late September and October, and the “Indian summer” will often intervene with some sun-soaked 70-degree weather. Weather – Fall aside, Chicago’s weather is quite terrible. Its winters are brutally cold — expect snow and intense, biting wind. Summers are undependable and can swing from 95 and humid to cold and rainy in a matter of days. Traffic – Although many admire Chicago’s public transit system, sometimes the highways are unavoidable. It’s important to plan your trip, so that you can dodge heavy traffic during rush hour. Make sure to also plan your route with toll roads in mind—the tolls in Chicago are rather heavy, reaching upwards of five dollars on some highways, and numerous… you can’t get many places without hitting one. 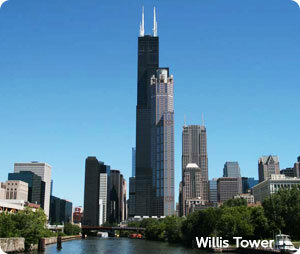 Cost of Living – The cost of living in Chicago is very high, like with most major cities. Look into finding a roommate in advance so that the two of you can share rent, utilities, etc. Making matters worse, the sales tax in Chicago is the third highest in the U.S. It is currently at 9.5% with an additional taxes for groceries, soft drinks and prepared foods. Blizzards / Lake Effect – Lake Michigan causes a phenomenon called “lake effect”. Lake effect occurs when cold winds pass over warm bodies of water, picking up and freezing water vapor, which then gets dumped on land as snow. Chicago already gets snow, but the lake effect causes extreme snow falls, resulting in blizzard-like conditions and many feet of puffy white. In 1967, for example, one storm dumped 23 inches of snow. Tornados – Located at the northern end of tornado alley, Chicago gets severe thunderstorms and occasional tornados. Several large tornados throughout history have hit within Chicago city limits, the worst being in 1990, an F5 that caused about $165 million in damage. Since then, Chicago has vamped up its education and safety procedures so that people will know how to respond. When a tornado siren sounds, go into your basement, curl up near a stable wall, and cover your head. Want to talk to some Chicago moving companies? Find them for free right here: Chicago movers.